An anticipated meeting between the Iranian Foreign Minister and his American counterpart – possibly the last before the advent of a new and probably more hostile US administration in Washington – in the upcoming session of the UN General Assembly, offers Iran one last opportunity to prevent outstanding US-Iranian differences from detracting Iran’s plans for its economic rejuvenation and reintegration into the world economy. Western reaction to continued economic uncertainties exacerbated by high levels of migration and terrorist attacks by radicalized Sunni Moslems, is showing signs of resembling the kind of negative narratives not witnessed since the 1920s. Those events ultimately eased the way for the election of anti-democratic and Fascist forces in places like Italy and Germany who subsequently drove the entire world to another catastrophic war. Disassociating Iran from the dangers posed by the likes of ISIS and Al Qaeda, as well as other extremist Moslems imbedded in European and American communities, is an urgent priority for providing a correct understanding of Iran’s non-involvement in these affairs. Just as in the case of the nuclear dispute, Iranian diplomacy can come to the rescue by ensuring that populist politicians do not poison the atmosphere against Iran and frustrate its efforts as it strives to play a positive role on the international scene while rebuilding its economy and reestablishing its economic ties with its traditional partners. Radical elements in Iran – a mirror image perhaps of their counterparts in the West – consistently try to undermine and denigrate the Rouhani administration for its overall gullibility in face of a disingenuous 5+1 led by America. They contend that despite humiliating concessions by Iran in the nuclear deal, major barriers essential for improving the economy and the lot of the Iranian people have not been removed. Concerned with the slow pace of progress impeding the economic reconstruction of the country, both Ayatollah Khamenei as well as President Rouhani have also been quite outspoken on this issue, with Khamenei having harshly accused the US of fraudulent conduct. Nonetheless, they both realize that going back to the pre-2015 situation is not a real option and cannot under any circumstance be construed as serving the interest of the Iranian people. Therefore, there lies but one road ahead for dealing seriously with the country’s economic crisis: reliance upon the kind of diplomatic dialogue which has in the past three years successfully overhauled and transformed Iran’s image in the world. 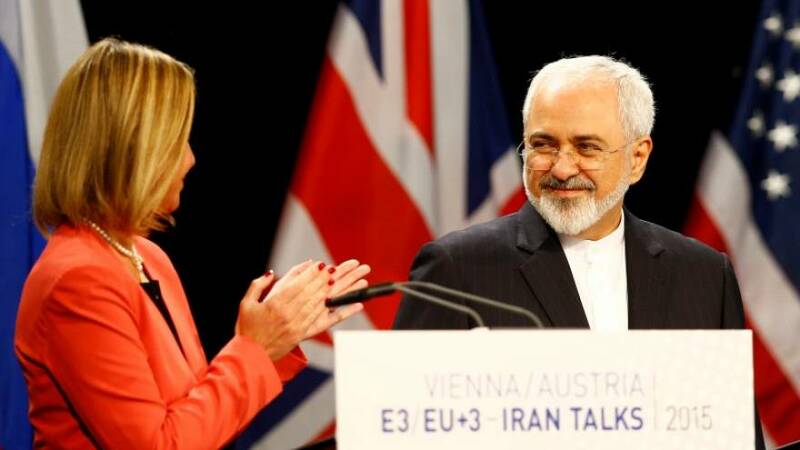 It is important not to forget that during the entire period while the nuclear deal was being negotiated, there was no relenting in the level of venomous language that was exchanged between hardliners both in Iran and the West. Indeed, every single step forward achieved by Iranian diplomats and their counterparts in the 5+1, was attained despite all the obstacles placed before them by self serving forces in the US, Israel and Saudi Arabia whose interests are best served by an ostracized Iran that is kept isolated from the West. Today, improving Iran’s economy by providing jobs and stimulating domestic production is the number one priority of the Rouhani government. This can only happen by a huge influx of capital and technology into the country. Hence, what is required is an unimpeded effort to ensure that Iran’s relationship with the major international financial institutions and various key Western industries is put into place. Given the state of current turmoil in the Middle East and the increasing tide of ‘anti-Iranian provocations’ generated by populist politicians and well funded lobbies in Washington, this is a delicate task that needs to be confronted head on and as soon as possible. Constructive dialogue between Zarif and Kerry at the General Assembly – much like the process leading to the nuclear deal, can side track populist diversions and lead to the start of a process in the remaining months of 2016, that could set in motion a mutually beneficial ‘bi-lateral coordination’ focused on ejecting ISIS from all its key strongholds as well as containing violence, instability and migration in places like Syria, Iraq, Afghanistan and Yemen. Time is now of the essence for the US and Iran to prevent another missed opportunity that is nothing short of a ‘strategic mistake’ by pre-empting populist ranting and focusing on the kind of real dangers we all face in a changing world.